Sunniva Rødland is a Norwegian harpist, based on Nesodden, outside of Oslo. As an independent musician, she has worked professionally for more than twenty years. Rødland has a broad repertoire and appears as a soloist, chamber musician and orchestra musician on a regular basis, reaching thousands of audiences in many parts of Norway. Her artistic focus is on contemporary music and projects that crosses the boundaries between music and the visual arts. She continues to dedicate herself to bringing the harp into the 21st Century as well as developing the role of the musician. She collaborates with multiple ensembles and cultural institutions and has worked closely with many composers. Rødland has produced multimedia concerts and initiated several innovative projects. In 2016 she produced and released a CD in collaboration with the Norwegian record company LabLabel. Rødland regularly gives lectures on her artistic experiences and research. She is also involved in talent development, teaching the harp at the Oslo musikk- og kulturskole for more than twelve years, as well as being a harp- and piano-instructor at youth orchestra courses. In 2008 she was Willy Postma’s assistant harp teacher at the Norwegian Academy of Music, where Rødland also gave lectures in Instrumentation and Contemporary Music Interpretation. Rødland studied at the Norwegian Academy of Music (with Willy Postma) and at the Royal Welsh College of Music and Drama (with Meinir Heulyn and Caryl Thomas). 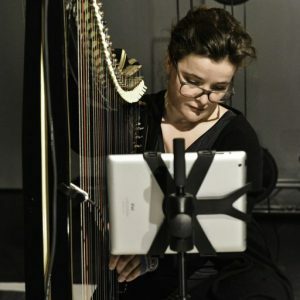 Among Rødland’s achievements are her Artistic Research Diploma (equivalent to PhD) from the Norwegian Artistic Research Programme/Norwegian Academy of Music and having performed eighteen world premieres of solo music for harp, many of which were commissioned by her. Two of her most recent commissions were included in the Darmstadt Summer Course for New Music 2016.